San Ni Ichi was a small card game I saw at the Indie Tabletop booth at PAX East this year. Put out by Ironmark Games, it’s a light trick taking game played over the course of seven turns. Each turn players will simultaneously play a card from their hand, either an attack or weapon. Cards are then resolved from lowest number to highest. Defend by placing a card on their own pile. This seems like it’s not a great idea at first, but, for example, a low number fire card can be placed on a higher number wood card. More on this later. Counter by placing the card on their own pile and then moving their combat pile to another player with an empty combat pile. Choose the Path of the Open Hand by discarding their card. Weapon cards can also be played, and their special actions are resolved as stated on the card. Once all the players have taken their action the player with the highest value on top of their combat pile takes the pile and moves it to their damage pile. All other combat piles are left in play. This continues until players are out of cards. Damage is tallied and the player with the lowest overall damage wins the game. It’s a very quick game, and has a bit more to it than meets the eye. Defending, like I said before, usually doesn’t seem like a good idea. Keeping low value cards on top of your pile comes in handy, though, since you won’t have to move those to your damage pile. Countering, while not easy to pull off, is a great way to make sure cards stay out of your damage pile. Weapon cards have all sorts of effects, like swapping piles or providing extra damage to other players. My kids and I enjoyed this one, and I can see it hitting the table again in the near future. Ironmark Games has done a great job getting a solid filler to the market, and it’s one you should really give a shot. 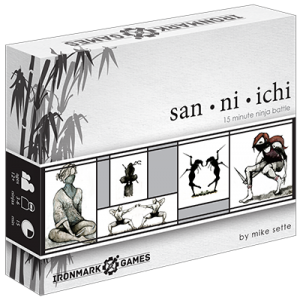 A copy of San Ni Ichi was provided free for review by Ironmark Games.